I have had this bowl in my family for a long time and have been looking for information about its origins. Any help/information would be much appreciated. The bowl makes the appearance of a mid 19th century bowl. During the Tongzhi reign and later a lot of similar, thickly potted bowls were made. The decoration is excellent work, but the green inner and bottom give the appearance that it is fairly new. 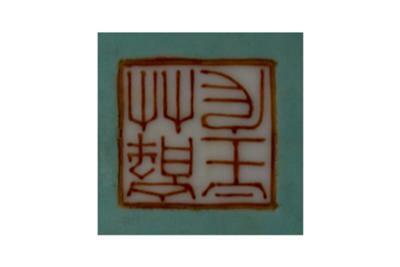 The mark is also more in a character style of 20th century artist's marks, quite unlike the usual marks at the time. A beautiful bowl, but it cannot be too old, in my opinion. These are some of the pictures you requested. If you need any more i will gladly take and upload them to flickr. 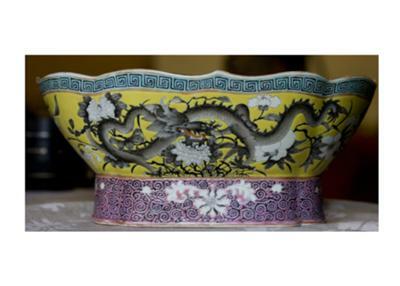 There is a different dragons on either side of the bowl, i have taken pictures of both of them. The pictures are too small to tell what it is. The mark is sufficient, but is irrelevant to the items age. Can you provide closeup pictures (partial pictures) of the top rim, decoration, dragon head, as well as pictures of the foot rim and bottom? Pictures should have good resolution and show detail, like any blemishes are age signs. You can upload more pictures via new submissions or, alternatively, you could the pictres upload to a site like Flickr or Photobucket and post the links here.